I read on Brainpickings recently that Mark Rothko, the marvelous abstract expressionist painter, said that when people “weep” when seeing his paintings they are having the same transcendent experience he had when he painted. Transcendence is an interesting word. 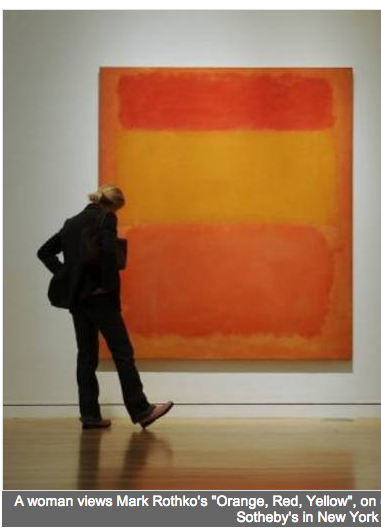 It made me remember once when Rothko’s work might just have saved someone’s life. Ten years ago, I was in divinity school, studying theology and quite seriously considering taking religious orders (albeit as a closet agnostic). Part of my practical training was working as a ER hospital chaplain, and I was on call to comfort the dying and give succor to the injured. Often, I was called in by hospital doctors or nursing staff to help people find a way towards a peaceful ending or when someone had just experienced a serious loss or accident, and needed to be calmed. Most of the work involved paying attention and simply being present and focused on a person in need. This was a gift to people in short supply in a harried and painful time. It is amazing to me how many staff members – and family members – simply don’t listen to patients in hospitals. So most of what I did was listen. On one early Saturday morning, I received an emergency call from the hospital. The ER intake nurse needed me there, STAT. A serious accident had occurred, and a survivor of the accident was too agitated. He needed to calm down. They could not medicate him because of his injuries, but they needed him to cease being so agitated. His blood pressure and his agitation were potentially making his injuries worse, and made it hard to do local surgery on him. Would I help? I said I would come. I did not know if I could help or not, but I could certainly be with him. I had found that sometimes, just being present was help enough. When I arrived, the staff told me that in the car accident, his friend in the passenger seat had been killed. He had survived, but just barely. We can restrain him, said the intake nurse. But that would be less than ideal. And we can’t medicate him right now. He probably has head injuries. I went in immediately. In the next room, he was on a hospital bed, and kept trying to leave the hospital, despite his copious injuries, which included a broken leg, perhaps a broken arm, and various contusions and visible injuries. There were probably severe internal injuries too. He was indeed agitated. He kept wanting to get out of bed, and he cast his head from side to side, talking in a high pitched tone, trying to communicate his fears, his guilt about his friend, asking about what was happening, and how it happened, and why he couldn’t just leave. I just want to be out of here, out of here, he kept saying. I asked him questions about himself, trying to change the topic, trying to help him to see himself, and in seeing himself, perhaps to focus inwards, and calm. He told me he was a lapsed Catholic, and then he told me something I thought was important. I’m a painter, he said. I paint, I make pictures. Abstract expressionism. Then he went back to trying to leave the hospital. The nurses checked on him, shook their heads. Looked pointedly at me. Take care of this, he needs to calm down, they told me. We need to get him in surgery, and we can only give him a local right now. Get him calmed down. Yes, he said quietly. Yes. Already, his face calmed visibly. Someone knew how he felt. Someone spoke his language. He looked at me. He nodded slowly, he closed his eyes, and I thought he was drifting in and out of consciousness. But he wasn’t. Rothko, he said clearly. Rothko. You’re right. He opened his eyes. Now his breathing was no longer a gasp, his pulse almost visibly slowed. His face wasn’t red and upset, and now I could see the lines of a bruise forming under his skin on his neck and shoulder. He had really been banged up in the accident, and now he was coming to know what had happened. “Rothko,” I repeated in synchronicity with him. Rothko, we said together, thinking of the deep fields of light in the paintings. A moment later, there was a tear in the corner of his eye. My friend is gone, isn’t she? Jackie’s gone. “Yes,” I said. He sighed, he turned his head. Thank you, he said. Then he breathed deep, quiet to the core. After some time, I stood up and I went out, I told the nurses they could take him into surgery now.